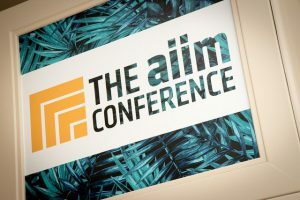 Another year and another AIIM Conference in the bag. It was a good year as the industry seems to be slowly coming to the realization that while content is a problem, the solution is to solve the business problem, not necessarily the content problem. The industry entered AIIM17 with a debate over whether Content Services or Enterprise Content Management (ECM) should be the default name for the industry. The speakers, and attendees, basically uttered a massive, “Who cares?” We are solving problems and learning how to make sure that not just information can be found. Valuable information can be found. Names matter because information professionals have to be able to discuss solutions to problems. We have to be able to architect them and evaluate how different technologies can be brought together. 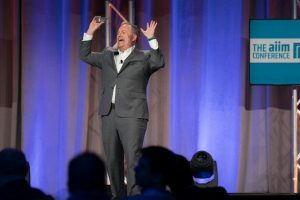 With that in mind, AIIM’s Chief Evangelist, John Mancini, put forth the term Intelligent Information Management during his keynote. It is a good term that had been considered in the past and nicely fits the existing acronym for AIIM. And as John said, for the most part it doesn’t matter what we call it. What most of the people at the AIIM conference does, and what TeraThink does, is deliver solutions. We look at business problems and find a way to address them. Content and data is part of the solution, so in comes the ECM and Information Governance experts to make sure the information is architected intelligently. Database vendors, unlike ECM vendors, do not try to sell you a full solution. They solve one problem very well. They manage structured data. As businesses have had to deal with higher volumes of data, Hadoop and NoSQL databases have come on the scene to help scale solutions. Big Data isn’t a solution, it is an approach to allowing analytics across even larger, and disparate, volumes of data. At their root, Hadoop and NoSQL databases are still tools to be used. ECM repositories are the same on many levels as databases. They allow for content to be modeled and searched. Metadata is not enough for search, nor is full text. Monica Crocker gave a great talk at AIIM17 about how to model content so it could be found. She was not a big fan of full text search but when you consider it just a facet of the overall process, it has value. Of course there is more to Content Management Systems (CMS) than just modeling the information. Instead of ODBC or JDBC (which are both used for retrieving data) we have CMIS (Content Management Interoperability Services). It is a great standard that was built for sharing content between systems. Version 1.1 has most of the features that is needed to manipulate content in a repository. But we need more. I’m not just talking about better vendor support. Why is CMIS not enough? Because ECM systems have business rules, templates, workflows, transformation engines, and a multitude of other tools. As Andrea Chiappe pointed out in her incredible (and Star Wars themed) session, CMIS is important but it doesn’t cover the special features that caused you to buy that #ECM system (paraphrased). To for CMSs to become the provider of Content Services, they need to supplement CMIS with their own Open API. The depth of the systems needs to be leveraged so that solutions can be built without rebuilding everything from scratch. Where do we go from here? The obvious answer that I learned years ago is Forward. At TeraThink we have decades of modeling content and leveraging the right systems to build solutions. We routinely shy away from broad ECM implementations to focus on problems where information, be it data or content, is front and center. This does not mean that there is no longer a space for the average CMS to be front-and-center. There will always be a need for a better way to collaborate online. The success of Slack over the past few years clearly demonstrates that need. Dropbox and Box have both showed that we are still looking for better ways to share content with others and between our own devices. As these systems evolve, they’ll add more features that traditional CMS vendors have been building for years. The content problem isn’t as big and unwieldy as it has been in the past. Often it just takes a step back to assess, plan, and move forward. If you would like to chat about where you are, and where you should be going, let us know. We can chat, share the latest of what’s happening in the space, and both learn something.